Huddersfield is a very beautiful town in West Yorkshire, England. The special atmosphere of the city and architectural refinement attract thousands of tourists from around the world so today I’m focusing my map research on the town and its university. Its location – one hour from Liverpool, York, Manchester, Newcastle, Sheffield and Birmingham and only three hours from London – makes the city an ideal place to explore different parts of the UK. Huddersfield is a thriving and friendly regional centre in the north of the country. The lively city centre with its Victorian architecture is characterized by a magnificent combination of traditional and modern styles. It has the third tallest building in the United Kingdom – Victoria Tower on Castle Hill. Every year the city hosts many different festivals that attract a considerable number of tourists. One of these festivals is the festival of fire. It is usually held in November near the famous railway station in the city center. The beauty of landscapes surrounding Huddersfield is breathtaking. Local features provide plenty of opportunities for mountain biking, hiking and other outdoor recreation. But why is this pretty town so attractive especially for students? First of all, it is famous for its university. In addition, Huddersfield student accommodation is the cheapest in the UK. You will be able to study, rest, exercise, have fun and meet friends – all this will transform your life in Huddersfield into an unforgettable adventure. The University of Huddersfield is one of the best British universities. It is a modern, successful institution with an innovative approach to educational activities and glorious traditions. The University is located in a safe and accessible place near the city center and the train station. This university differs from other schools of England in terms of special attention to the development of practical skills of students: many training programs include both theory and practice. Many graduates of the University continue on to such world famous companies as Microsoft, Panasonic, Intel, Ferrari, Rolls Royce, BBC, HSBC. It now becomes clear why so many students from around the world dream to study in Huddersfield. In addition, the University of Huddersfield ranks among the top 10 UK universities in the quality of teaching. But for me the most interesting thing about the university are these maps of the campus. I especially enjoy seeing university maps from different eras and comparing them to see how the campus has grown over time. Universities are often a hive of development and new buildings or route layouts pop up all the time, so a map can totally change from one academic year to the next. I really like maps of small areas like this, created specifically to help visitors to find their way around a new environment. The layout of universities can be very complicated and these maps ensure that students find their way to lectures on time (most of the time!). As someone who loves studying – I’ve been a student for a total of 9 years at different institutions – I actually get rather excited when confronted with a new campus map because it means I’m about to start learning something new. 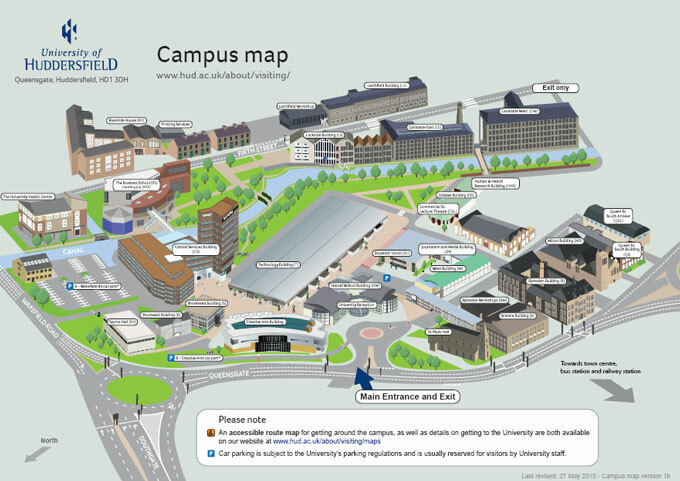 Anyway, let me know if you too like a good campus map and tweet me a photo to @Cassiefairy if your university has a particularly interesting map!